When I think about my grandparents I have so many rich memories of a time that has passed. Not that this is a bad thing – progress has helped move most generations beyond the way they used to live. But, there are aspects of my childhood memories that recall a time where things were simpler and less hurried; where a meal around the table was a “normal” thing; where kids’ playing outside until almost dark was common. My grandparents, on both sides of my family, were poor, like many of their generation. They lived in small homes surrounded by fields to be plowed, planted and harvested – but they didn’t own the fields. Visiting their homes was like visiting another world. On my Mom’s side, my Granddaddy and Grandmother Snyder lived in Pantego, in the southeastern part of North Carolina, in a simple house with rusty screen doors, creaking floors and, early on, a pump on the back porch that you had to prime with a cup of water to get the water to flow. I can still hear the sound it made as the pump mechanism gurgled and sucked bringing the cool, clear water up from deep below to run in the sink. There was an aluminum dipper that hung on a rusty nail close by and there was nothing colder or that tasted better than that water from that old pump when you touched your lips to that dipper. They had a living room, kitchen and two bedrooms – one for Grandma and one for Granddaddy. Grandma’s room had a big bed (probably not more than a “regular bed” now). She had one of those white chenille bedspreads with the fuzzy pattern on it where I spent hours tracing those patterns and probably driving matchbox cars on them during afternoon naps. Granddaddy’s room was just down the hall. He had a big bed too with a deep feather tick and a quilt for bed spread. Granddaddy Snyder always kept his door clos ed in the wintertime and I can still feel the deep cold on my nose and face as I lay nestled down in that feather tick under what seemed like twenty quilts to keep us warm. When we visited it seems like I always slept with my Granddad who always wore long johns to bed (at least in the winter) with a “back door” flap that buttoned up. If he needed to use that flap it would be on the “slop jar” or, more properly, chamber pot that sat on the floor. 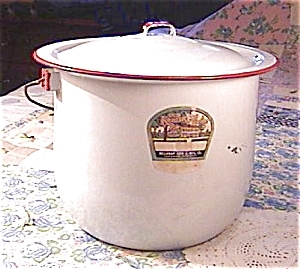 These white, enamel pots with a red ring around the top and lid were where you went to the bathroom at my Grandparents house for many years. When the jar was full the contents were tossed in a ditch out from the back porch. I’ll never forget using that pot and will also always remember the year the “children” kicked in some money to finish the bathroom that had been “dried in” at the end of the hall. Granddaddy Snyder raised goats and when we would visit my sister and I would often get up early (really early) and head to the barn with him to watch him milk the goats. Goats are social animals – curious, gentle and independent. Shy of anyone except their owners they need a group of other goats to socialize with. My Granddaddy had several and they had little ones who would romp and play and make us laugh. They didn’t always listen, but when Granddaddy would yell or rap them on the horns with his cane they knew what he meant and mostly did what he said – as did my sister and I when he used the same tone of voice with us. I have so many good memories of playing in that house and yard; of Grandma’s love and Granddaddy’s smile; of the sound his rocker made when he rocked in the living room; and how he would “shoosh” me and my sister when we made too much noise while he was listening to the news on his old tube radio with the dials that glowed. 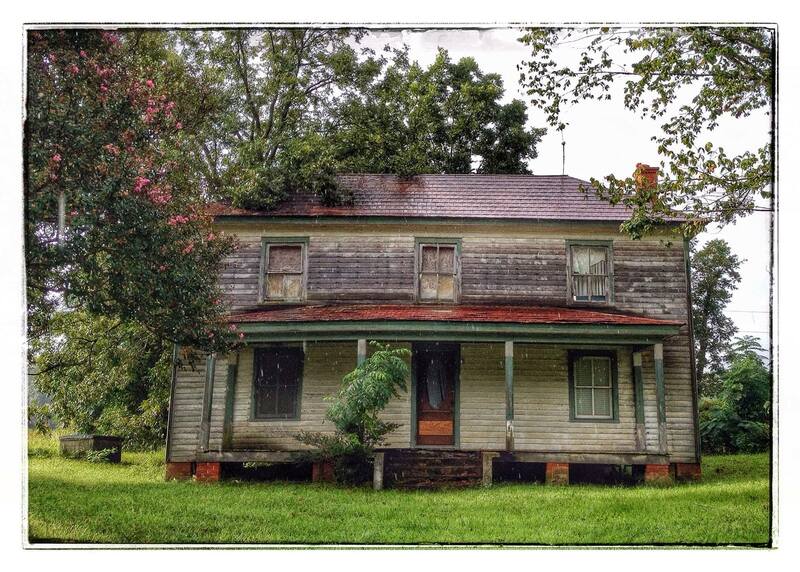 A couple of hours north near the Virginia line, my Granddaddy and Grandma Bryant lived in a small home with a glider the size of a sofa and a swing with rusty chains on the front porch and an old well in the yard. Before they filled it in that well had a bucket on a rope and little tin roof to keep the leaves and debris out. It was right out of a storybook and I remember my sister holding me up so I could look over the side and see my small reflection in the pool of water far below. We weren’t supposed to throw rocks in there, but the driveway was gravel and the temptation too great. The house was old and full of musty smells and the front door was a storm door that made a loud squeaking noise when opened and it closed fast and hard when you let it go. I can still hear it slam. The foyer of the house had a chair and a sofa up against one wall across from the TV and I would sleep on that sofa when we visited. My Granddaddy worked second shift as a welder at the paper mill (or maybe he was the night watchman) and I remember times when that squeaking door would wake me up after midnight as he would come in with his lunchbox in hand and he would sit and we would talk for a few minutes before he went off to bed. They lived on a lonely, two-lane straight-away. At night you could hear the whine of the truck tires build as they got closer to the house then crescendo and fade away as they passed the house and blew down that road. It was a cold and lonely sound in the winter. That house introduced my ears to the chiming of a clock – I’ve built several over the years for our home. My grandparents had an old mantle clock that my Granddad wound most every night. If I woke up in that foyer in the middle of the night I could count the chimes and know how much longer I had to sleep. I still do this in our house at night. One common denominator, at both my granddparents’ houses, was the food. Tables full of food. Fried chicken, green beans, butter beans, collard greens, fresh corn (whatever was in season) and white bread rolls and ice cold Pepsi-Colas. 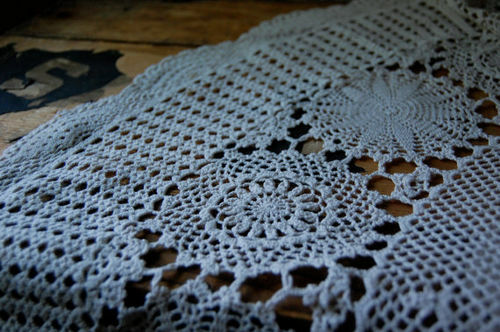 Like many of her generation, my Grandma Bryant had a hand made doily tablecloth on her “dining room” table covered by a clear plastic sheet and I loved to follow those patterns and feel the doily by reaching up under that cover. There were cakes too. Grandma Bryant made the best pineapple cakes and I always looked forward to the announcement of dessert, which typically meant I would not have to finish the vegetables I had expertly pushed around on my plate or carefully covered with my napkin . After a big meal she would leave the leftovers on plates and arrange them on a table in the backroom near the kitchen and then cover that table up with a tablecloth. If we got hungry, later on, for one more chicken leg we could go in there and reach up under that cloth to pull one out. That room also had a chest freezer in it and there was usually ice cream packed down deep in the frost where the “fog” would rise when you lifted the lid. If I was in that room that ice chest is where I was likely headed. All of these memories, like yours, are like pieces of a puzzle that make up a part of who I am. Your story may be similar if you grew up in the south. But now it seems like rusty screens, old slamming doors and old wells are things of the past. Certainly there aren’t many slop jars in bedrooms or hand pumps grandma’s back porch anymore. (Thankfully) In fact, my children have had a very different experience and in their early years grandma had more money and probably nicer things than we (their parents) did and, in some ways, that’s still true. We all have our own stories, filled with certain smells, tastes or sounds that bring back the rich memories of our lives and recall times that have passed and people that are gone now. It’s good to remember. It’s good to tell your stories to your family and friends. My friend, Tom Brennan, lives in the eastern part of North Carolina and has a keen eye for taking amazing photographs like the first one attached to this post. On his daily commute to Chowan College he passes the aging, decaying and sometimes broken down evidence of a time passed and a way of living long gone. He probably gets tired of me ranting about his latest photo of rust, a broken screen or dilapidated house that he posts on Facebook, but these things are such a part of me that I can’t keep silent when I see them. They take me back to the people and places I loved so much as a boy and they remind me of time passed but not forgotten. ← Whatever Happened to Mr. Whitfield? Where we are from is part of our story, but it does not dictate where we are going. We have free will, for good or ill. Keep the best, and may every generation improve. It’s a miracle we are here at all, considering how things had to line up to make it possible. Grandma and grampa shared a bed at one time that made your parents who made you. So true, Ed. I’d like to hear your story on grandma’s house sometime.